Did you ever wonder how fragile fossil bones make it back, safe and sound, to the Science Museum of Minnesota for cleaning and display? The answer is illustrated in the photos above and below. When paleontologists discover bones in the field, they go through a standard process of excavation that involves several basic steps: 1) exposing the edges of the bone; 2) pedestaling the bone; and 3) jacketing the bone. Most of the time, our first hint of a fossil lying in wait underground comes from a scattering of broken bone bits at the surface. Tracing those bits to their point of origin sometimes leads to the discovery of much larger, more complete bones. You begin "chasing" the bone by following it to its end, and exposing the outline of the bone's surface. Pedestaling, the second step in excavation, often is the most time consuming. You must dig a trench completely around the bone, and begin to "undercut" the element so that it rests on just a small "stem" of sediment. The final step is jacketing. 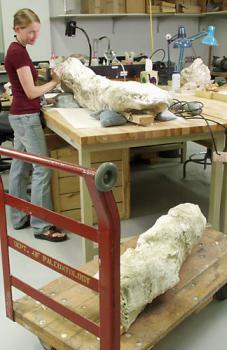 The pedestal is completely covered in wet paper towels, which are pressed onto the surface of the bone. Then, multiple layers of plaster-soaked burlap strips are wrapped around the pedestal, just as you would wrap a broken arm. After the plaster hardens, the bone is broken from its pedestal and flipped onto its jacketed side. Excess sediment is removed, and the under side is also jacketed. Sometimes, wood is added to the jacket for extra support and for handles. The bones encased in these plaster jackets belong to duckbilled dinosaurs (hadrosaurs) that inhabited the Late Cretaceous of Montana. The bones are around 78 million years old, and are two of the hindlimb elements, the tibia and fibula, from a single animal. Right now the bones are being cleaned and put back together by skilled SMM volunteer preparators. They work patiently until the bones are cleaned and all the cracks are carefully hardened with special glues. Then, the bones can go on display at the SMM, or be housed in our collection where researchers can study them.